»Visit Ellora Caves – One Of The Largest Cave Complexes In The World! 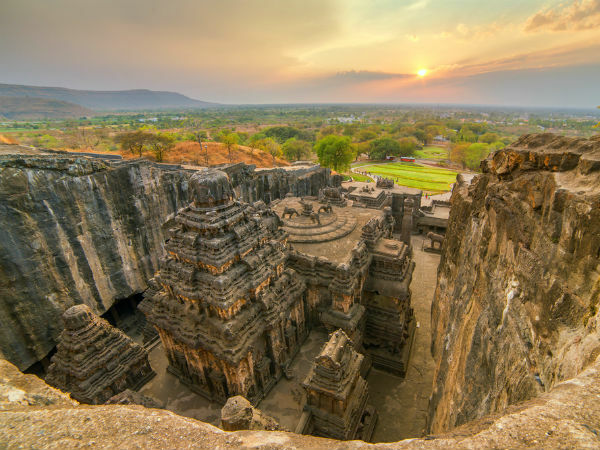 Visit Ellora Caves – One Of The Largest Cave Complexes In The World! India is home to some of the greatest monuments in the world. One such awe-striking monument is the Ellora caves in Maharashtra. It is one of the biggest rock-cut cave complexes in the world, due to which it is recognized as a UNESCO World Heritage Site. These caves contain some of the most magnificent carvings and paintings made during the 600-1000 CE period. Nestled in the thickets of the Western Ghats, Ellora houses over 100 caves, out of which only 34 are on display. These caves reflect a beautiful blend of Buddhist, Hindu and Jain artistry and architecture. These caves were built mostly under the reign of Hindu dynasties like the Rashtrakuta and Yadav dynasties. Kailasa Temple built in Cave 16 is the largest monolithic rock excavation in the entire world. The caves come under the Archaeological Survey of India. Ellora caves must be visited between the winter months of October to February, when the weather is cool, chilly and its best. The monsoon months of June to September are also pleasant but commuting might get disturbed. Summer in Ellora is quite bad since the scorching heat of the sun might not give you the best experience while you explore the caves. The fort that used to be under the control of Shivaji Maharaj is now a favoured trekking destination. Mahuli Fort is the highest peak in the district of Thane. Located 70 km from Mumbai, Mahuli Fort can be found in the Asangaon village. Mahuli Fort comprises of two or three hills that share a pinnacle. A small Shiva temple and three caves are dotted around the fort. The forest surrounding Mahuli Fort has now been declared as a sanctuary. The picturesque hill station of Igatpuri is located around 50 km from Asangaon. Filled with natural resources, Igatpuri is a beautiful tourist hotspot in the Nashik district of Maharashtra. Some of the places that must be visited in Igatpuri are Amruteshwar Temple, Camel Valley, River Bhatsa Valley, Kalsubai Peak and Arthur Lake. These places offer a perfect escape into the laps of nature. Sri Gondeshwar Temple located in Sinnar is a magnificent black-stone temple, dedicated to Lord Shiva. Since it is built in the Hemadpanthi style of architecture, there are four more shrines located at the four corners of the temple, dedicated to Lord Ganesh, Lord Vishnu, Goddess Parvati and the Sun God. It is an architectural marvel that dates back to 1069 AD. The Hemadpanthi style of architecture was popularized by a minister of the Yadav dynasty, which became a common style followed by many temple structures during the time. Gondeshwar Temple is one of the few temples that is still in good shape. One of the most important and holy destinations of India, Shirdi is located about 58 km from Sinnar. Shirdi is believed to be the home of 20th century's most respected saint Sai Baba. Hence it is a pilgrim site that houses many temples. Gurusthan, in Shirdi, is believed to be the region where Sai Baba spent a major part of his time. It is open from 5 am to 10 pm on all days of the week. Samadhi Mandir and Dwarkamai are some of the other places that must be visited in Shirdi. Historically, the Ellora Caves served as a pilgrimage site. Some caves were monasteries, some were temples and some were spiritual sites used just to gather devotees. As mentioned, the Ellora caves have Buddhist, Hindu and Jain architecture and can be distinctly divided accordingly. Cave 1 to 12 belonged to Buddhists, 13 to 29 belonged to Hindus and 30 to 34 were Jain caves that were all used for various purposes. Out of the 12 Buddhist caves, Cave 10, which is the Vishvakarma cave, is the most popular one. It is also known as Carpenter's Cave since the architecture of the insides are so splendid and finished so well that the stone looks like wooden beams. It is the only prayer hall or Chaitya Griha, with a 15 ft statue of Gautama Buddha at the heart of the cave. The statue is in the form of his preaching position, and the cave has eight subsidary cells. Kailasa Temple, found in Cave 16, is a remarkable temple that has been carved out of a single rock. This makes it the largest rock-cut Hindu temple in the world. The fascinating Kailasa Temple, dedicated to Lord Shiva, is believed to have been built by King Krishna I of the Rashtrakuta dynasty. This architectural marvel is notable since researchers believe that it was built by carving the top and then continuing downwards. This would probably not be the same if the excavations began from the front. Rameshwar Temple and Dashavatara Temple are the two other beautiful and exquisite structures that must be visited at Ellora. Although the Jain caves aren't as huge as the Buddhist and Hindu caves, they have some of the most exquisite carvings and detailed artwork. Excavated in the 9th century, the 32nd cave is the Indra Sabha which houses a monolithic shrine. Cave 30 resembles the Kailasa Temple in terms of the carvings, which is why it is called as the Chota Kailasa which means "Small Kailasa". Read further about the popular tourist places around the Ellora Caves. Being the last temple of the 12 Jyotirlingas of India, Grishneshwar is a prime pilgrimage site for the devotees of Lord Shiva. The word Ghrneshwar translates to 'Lord of Compassion'. The temple is located a few kilometres from the Ellora caves and is a classic example of the South Indian temple style of architecture. The temple has seen many damages through the Hindu-Muslim wars in the past, and so has undergone many renovations. Aurangabad is a historical city, that used to be the capital of the Mughal Emperor, Aurangzeb. It is 30 km from Ellora and simply cannot be missed if you're visiting the caves, due to the many relics that can be witnessed here. Bibi Ka Maqbara, also known as the Taj of the Deccan, has a stunning resemblance to the Taj Mahal of Agra. It looks like a miniature version of the Taj. Panchakki water mill, Daulatabad Fort, Salim Ali Lake are some of the other places of interest in Aurangabad.